Between the years of 2001-2005 I was a proud helper and coach for Steve Fallon, Steve Fallon Sports. It’s with great respect, appreciation and gratitude to Steve, that I had the opportunity to become the coach and business that I am today. Steve’s career, reputation and history was an inspiration to me, and I wished to one day create a story of my own within coaching. Without Steve’s help, support, guidance and kindness through my teenage years I wouldn’t have had that coaching education, opportunity, and experience. I am very grateful to him and all those I worked with when I was younger for giving me the confidence and platform I needed to make coaching become a realistic career path. In 2001, I was a year 10 student who loved football and simply thrived on sport & activity. I was very fortunate that Steve was willing to take me on work experience; to give me the opportunity to see what the coaching world was all about. I enjoyed the insight and opportunity so much so that I returned for two weeks in year 11 and furthered my learning within sports coaching. In 2003 I completed my F.A level 1 football course & then went on to work for Steve as a coach for the next 2 years at various schools, events and projects whilst at college. During this time I learnt my trade first hand, being offered a wide range of jobs that allowed me to explore many aspects of coaching, environments and situations. I thoroughly enjoyed my time and work with Steve Fallon Sports. In December 2005 I decided that if I was to make a real go of sports coaching, I needed to become self employed to allow me the freedom to make a potential full time living out of what once was just a passionate hobby. 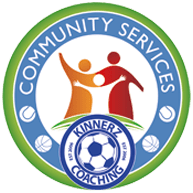 In January 2006 I set up business as KINNERZ COACHING and have been working hard ever since to make a difference within Cambridge, providing sports and activity to the wider community with passion, pride & care. I successfully became an F.A level 2 coach in May 2008, which was extremely beneficial to my learning, understanding and education within Football and coaching generally. Such a qualification then enabled me to move onwards and upwards with my experience and the services I now provide. I thank everyone past and present for all their support, loyalty and kindness through the years that have made running my business & working in Cambridge so forever enjoyable, exciting and rewarding. Long may KC continue, as I view what I do as a life long hobby, turned career. Thank you for your time and I hope this has been of interest to your understanding of who I am, what I do and why I do it.